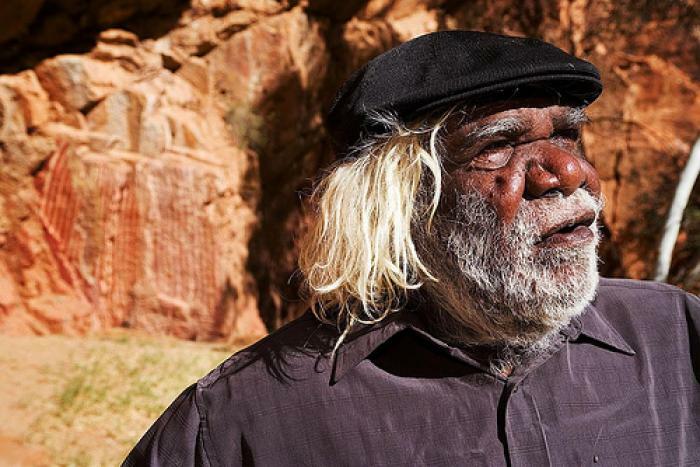 Around 1945, George Ward Tjungurrayi was born near sacred Lakarra in Western Australia. Like many other Pintupi, he came to Papunya in the wake of one of Jeremy Long’s Welfare Branch Patrols in 1963. George spent a lot of time looking at the work of his brothers Yala Yala Gibbs and Willy Tjungurrayi, who had become two of the most important painters of Papunya Tula in Kintore. George, who considers himself a true ‘bush man’ moved deeper into the desert to Kiwirkurra and in 1984 he began painting for Papunya Tula Artists. His subjects include classical grids of circles that tell the stories of his country and ancestors (Tingari). He also paints many Snake (Python) and Kuningka (Western Quoll, a carnivorous marsupial) Dreamings. After the death of his brother Yala Yala in 1998, George devoted himself increasingly to painting, and gradually developed a distinctive, personal style. The immense salt lake Kaakuratintja (Lake MacDonald) often takes precedence in his paintings. The combination of meticulous, geometric designs in George’s work, paired with the somewhat shaky, volatile dot-work results in exciting, vibrant and ever moving surfaces. In 2004 George won the Art Gallery of New South Wales’ Wynn Prize for landscape painting. 1995: Utopia Art Sydney, Australia?